The idea of a puzzle based on noughts-and-crosses came to me over ten years ago: I can’t be sure when. My first idea was that the grid would be 13 × 13 (that never changed) divided into 12 ‘games’, the symmetrically placed central lines spelling out a message and/or instruction. But what? I’d known the alternate US name ‘tic-tac-toe’ as it can be spelt; when I checked in Chambers and saw that the ‘e’ could be dropped, I had one of the lines: TIC-TAC-TO GAMES. At this stage I had decided that, to get the Oes and Xes there would have to be an alphanumerical substitution that would yield only 0 and 1, and that the preamble would have to include an instruction such as ‘multiply by ten, and make a further substitution’ to get the Xes from the 10s. But I lacked a 13-letter line to cross the one I had, one which crossed in the middle at T. Driving up to Sydney’s northern beaches — like many who read this, I suspect, I do a lot of thinking about crosswords while driving — I realized that MULTIPLY BY TEN had 13 letters, though its middle letter was not T. The fourth, however, would do the trick, though mildly upsetting the symmetry. When I set to work in earnest I had my 13 × 13 grid with the fourth rank and the seventh file, and nothing else. How to fill it? I have had four test-solvers over the years, at least two of whom have asked why did I not make the substitution A = 0, B = 1, C = 0, D = 1, etc or similar, which would have placed no constraint on choice of letters; why the more elaborate mapping? I felt from the outset that that would draw solvers’ attention to the fact that the game involved was a binary one, and I wanted to avoid that. So I next considered A= 0, B = 1, C = 2, D = 0, etc, or some variant of it; there was no way of allotting numerical equivalents cyclically in groups of three without at least one vowel’s having the value 2, so eliminating it/them. I felt not to have a full palette of vowels, including Y, at my disposal would be too much of a constraint. After a bit of experimenting I settled on A = 1, B = 2, C = 1, D = 0, E = 1, etc, so eliminating from the fill B, F, J, N, R, V, and Z. I knew that N and R would be missed, but was not too unhappy about the others. My idea for the original was that solvers would have to highlight the winning play in whichever games had one; the preamble stated ‘highlight the winning play or plays’. 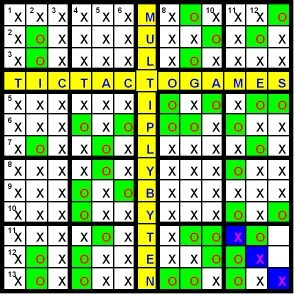 As most ‘games’ would not conform to an actual game of tic-tac-to (I rejected the idea of arranging words so that all games were theoretically feasible), for the good reason that each would have nine plays, that meant that I needed to allow for one unfinished game. I decided to place this critical game in the SE corner, leaving two cells empty. So I looked for a word for the bottom rank that had to have the last three letters yield numbers consistent with a tic-tac-to game. I used some program or application — I can’t remember what — to find a word whose middle letter of 13 was N. From the list I eliminated any with the outlawed letters, and found CHALCANTHITES, quite wonderfully containing ‘Chal can’t hit’: a sentence, rare enough, with clueing possibilities. I looked no further. It must have been at about this stage that I decided that the method of entry would be different. I wanted to clue both description and instruction completely — ie without unches; the former could be partitioned into TIC-TAC, TOGA, and MES (should I use a French word? or did ME allow of a plural?) and the latter to MULTI-, PLY, BY, and TEN; or the last five letters as BYTE and N. I was not happy about MES or clueing either a one- or a two-letter entry. Dimitry — rather, one of his puzzles — gave me an idea. During Easter 2007, I was holed up on a farm in Victoria with Dimitry’s Listener #3922 (thanks to Stephen Rice for identifying this). I do not now recall how it happened, or even what the solver had to do, but it must have been a carte blanche, because for some time I began entries in the wrong cells, not leaving sufficient space for the entries, and so had to spill over to the next line; eventually the penny dropped and I was able to complete as intended. But I remember thinking that it could be a useful way of constructing a puzzle. So this would be the puzzle in which I could use it: MES could become MESENTERY, say, or just MESA; there was no limit to the possibilities for N. I considered other break-downs: (FRAN)TIC, TACT, OGAM, ES(SE), say; (TU)MULT, I, PLY, BYTE, N( ) would have a one-letter entry again. I decided to stick with one of the original partitionings. The fill proceeded slowly, as I would at times carelessly include a forbidden letter, usually an N or an R. I should have liked the entries to have been consecutive without any intruding unches, or at least to begin so. My first grid had the first five ‘Across’, but only the first two ‘Down’, entries consecutive; in the one eventually published, three and four respectively (but would have been six had OPSIMATHIC been allowed). Given the method of entry, perhaps it is possible to construct such an unchless grid, but the constraint upon choice of letters increased the difficulty, and the task proved beyond me. 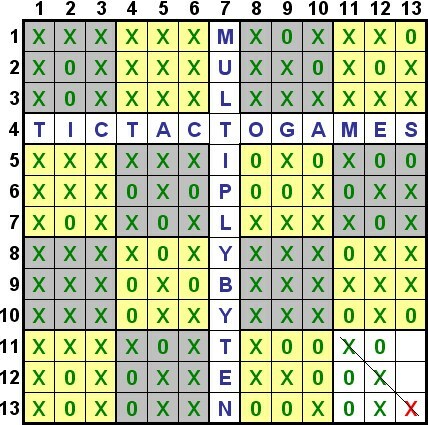 The puzzle sent to the first test-solvers, Dysart and Radix, was harder in that the clues were given without identifying in which rank or file each began. In addition, the preamble did not mention that there were two (at that time) empty cells; instead it stated that ‘127 cells are checked’, which enabled the arithmetically minded solver to deduce that two were empty. The vetters thought that it would be fairer to state that outright. 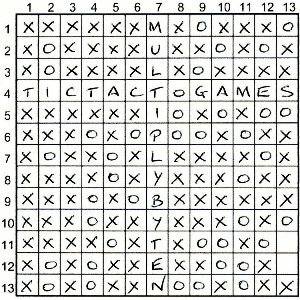 The grid at the time had an unfortunate flaw: both I and A of TIC-TAC were, unintentionally, unches; this meant that, as the clue then stood, the entry could possibly be entered as TACTIC, which rendered the puzzle virtually unsolvable. Solvers were originally required to enter 48 (later, 96) bars; Radix’s much more precise suggestion, which I incorporated, was ’32 boundaries of three bars each — 16 across, 16 down — to create a number of regions’. He also prophetically queried the plural CHALCANTHITES, and suggested a change of title, from ‘The Winning Play/s’ to the present one. I’m not sure why many solvers dislike entering bars — in a grid, that is! — but I accept it, and so that requirement was removed. I cannot be sure, but I think I submitted the puzzle for vetting in mid-2007; it entered the logjam that Roger and Shane inherited. In the meantime, another Listener puzzle which involved noughts-and-crosses appeared, in 2010 I think, and I feared that that would do for mine. When last year I received a vetter’s report, one of the comments was that the clues to each first entry — to CUISSE-MADAME, ‘Sadaam Hussein and mice chewed this nashi? Yes and no: wrong variety (12)’, and to CASTAWAY, ‘He may find company absent (8)’ — were too hard to make a start in what the other neatly called ‘a demi carte blanche’ (or was it ‘a demi-blanche carte’?). ‘Saddam’ is, of course, the accepted spelling, but I found surprisingly many ‘Sadaam’s on the internet, possible misspellings. The unching was quite deliberately unXimenean: I felt that the difficulty in placing the entries called for greater checking than usual, though there are probably too many fully checked entries. After I had received the first report I noticed that, of the ten cells in a 2 × 5 block in the NE corner, six contained unches; that seemed unfair in a puzzle with unusual entry method, so I set about loosening it (there are now only two). 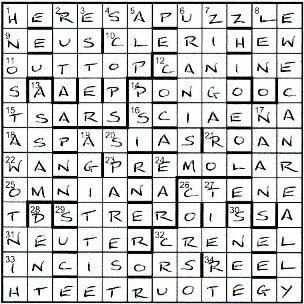 The puzzle subsequently had another two testers; I think only two of the four mentioned the constraint on letter choice — the lipogrammatic aspect of most of the grid. I shall be interested to see whether many solvers comment on that. I have received a number of complimentary comments on the clue to LOLIGO. My original was ‘Behold, progressing from head, ‘limbs’ eight (eight? two others) here (6)’. I hope the chief vetter, Roger Phillips, will not mind my revealing that his comment was ‘The things from which letters are to be progressively taken must be words: expecting the solver to take “two others” as a unit is unfair’, and tweaked the clue to the far superior published version: brilliant! Ahah! A carte blanche. One of the numpties likes these; it is the task of fitting the answers into the grid that is her forte, while the other poor numpty has to work at solving the clues. Of course, it wasn’t quite a blancmange, as we were given help, with clues related to ranks and files, but this help was mitigated, in that some of the words went beyond the line, so that we had to do some grid-filling before the intersecting words were a great help. Even then, there were tricksy ones like ICES, that slotted so neatly into the head of file 3 but preempted the placing of LIES and TICTAC until we moved it down a couple of squares! Here’s an admission; it has taken about three years of regular solving of these puzzles for me to reach the stage where I actually look forward to the challenge rather than dreading Friday evening. There is a feeling, these days, that we will manage, even if it takes till Wednesday. (What a dangerous thing to say – will we be constructing wrens from numerical grids with knights’ moves graphed on tori next week?) That comment was simply to encourage newcomer solvers who regard some of these puzzles as almost impossible. Patient practice and familiarity seem to work. Familiarity – hah! There was an obvious anagram at One ‘Rank ‘Pear sauces I’m cooking, specially made’ so we smile and begin to work on PEAR SAUCES I’M and get nowhere! We already have TALC at the end of Rank 1, and CASTAWAY, MOES and C at File 1, leaving the ULLIS at the head of File 2 but it takes us a while to resort to Bradford and find that there is a pear called CUISSE-MADAME. We needed Rank 13 before we were really underway with out grid fill and from ‘One of I Zingari is no batsman — needs energy for delivery of mine? (12)’ we teased out CHAL (gypsy) followed by CAN’T HIT (he’s no batsman) and E (energy) to get something delivered by a mine – a mineral (what a sneaky definition!) CHALCANTHITE. We had a good laugh too. These clues were delightful weren’t they? SESQUIPEDAL was, of course, written specially for us with all that French in it. ‘Une moitié de gosses’ – well, that’s SES (it was already in place in our grid) and ‘who locally’ – we say QUI -followed by PEDAL (ride in the Tour de France) and we get a word that refers to the pretentious use of ‘vélocipède for bike’. Nice! Soon, the grid was filling itself. That’s masterful construction, I think, and we had MULTIPLY BY TEN and TIC-TAC-TO GAMES that leapt out at us. That was the penny drop moment, and what had seemed to be BYTES, turned out to be Os and Xs. We skipped the in-between stage once we had realized that no letters with a value of 2 were going to appear in our final grid (though one did! Hands up those who had BELTED in File 11 and had to change it to PELTED when the penny dropped – a forest of hands I see!). We simply converted to 1 multiplied by ten, which gave us X ‘using a notation that accords with the description’ and filled in our TIC-TAC-TO GAMES, reflecting that in most of them, X was a bit of a cheat, filling in most of the squares while O was sharpening his pencil (of course, Ozzie had anticipated our reaction by telling us that we had a ‘mostly incorrect’ description of the remainder of the final grid). But not completely ‘incorrect’ – there was that last unfinished game in the south-east corner and X was able to continue his winning streak. We were reflecting on the brilliance of Ozzie in constructing this grid where no letters worth 2 had to appear (though that might not have been as difficult as it appeared at first sight, as he had to avoid B, F, J, N, R, V and Z. Undoubtedly omitting N and R would involve quite a bit of wriggling but the others probably disappeared of their own accord). All the same, this was a superb crossword wasn’t it? Thank you Ozzie for lots of fun! I used to think of Ozzie as a regular Listener setter, as he certainly was in the early nineties, but this is only his second since 1995. I suppose that we all get less productive with age although he has also set four of the monthly puzzles for the Crossword Centre in that time (Aug 2002, Mar 2004, Oct 2004 and Oct 2005). I retain fond memories especially for the third of these, An Undecided Game. It was a brilliant concept for a puzzle based on a game of snooker with the grid entries bouncing off cushions and balls, sometimes several times, and sometimes ending up being potted. I think that it would have made for a memorable Listener but for the fact that it was somewhat convoluted. Reading between the lines, it would appear that Ozzie decided to retire from crossword setting at around this time (2005) but he has recently returned to the CC Message Board and now with a new Listener. Only the T of talc would fit into rank 1 leaving ALC to continue in rank 2, which meant that file 3 started with IC. I suspect in common with many solvers, I confidently entered the answer to 3Fi (ices) here but in fact ices did not start until rank 3. Similarly, the A at the top of file 10 did not belong to the first A of adaws (10Fi). If we did not know the identity of the setter then we might have made an educated guess by considering those clues with ellipses. Generally these are used merely to combine two fragments into a coherent sentence but Ozzie has been known to go a step further. The following pair appeared in his previous Listener, Musclied Miss Lued is Clumed, back in 2005. Clues were of three types where the definition was affected in the same way as the grid entry. I wasn’t particularly happy with bed for an amount of soil (or beating the poor piglet) but of course it should have been pelted – ELT in PED. My mistake came to light when substituting numbers for each letter (see below). I like this solution, it is most unusual, but I think that the win should have been awarded to 0 by default since X had so blatantly cheated in most games! Thank you Ozzie, you have proved that you can still do it so I look forward to your next. This week, we were faced with a 13×13 carte blanche grid. The preamble started “Clues are given in order across the ranks and down the files …” with the clues listed under the headings Ranks and Files. This must be a hint that the puzzle has something to do with Chess or Draughts. Anyway, no shenanigans with the clues, but entries could start anywhere in the designated rank or file and continue on the next line if necessary. The rest of the preamble could wait until the grid was complete. 1ac (or 1rk, if you prefer) was Pear sauces I’m cooking, specially made (12) (an anagram of ‘Pear sauces Im’), followed by a straightforward Powder one in solicitous concern (4) giving TALC. 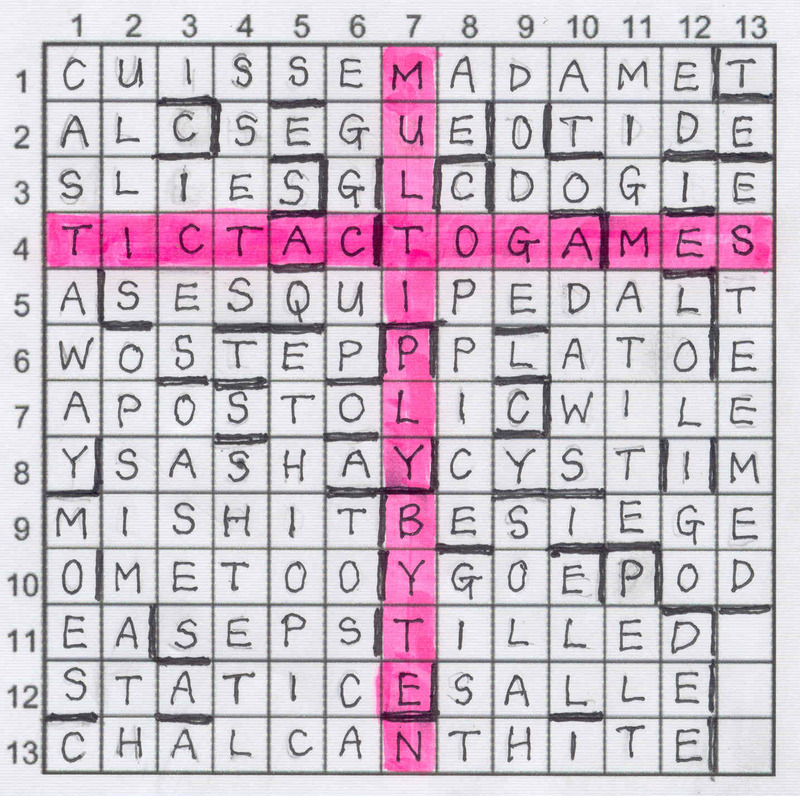 This fixed the 12-letter word starting in the first square, with TALC starting in the last and continuing onto the second rank. I decided to work my way down from the top left and see how I got on. 1dn (or 1fl) was (8, 4, 6) so that fixed them starting in the first square as well. The last two were MOES and CULLIS, and I thought a quick finish might be on the cards. 1dn CASTAWAY made me concentrate again on 1ac. Perhaps it wasn’t a full anagram, but a pear followed by an anagram of ‘sauces im’. I don’t particularly like pears so had to resort to Bradford’s for some help. 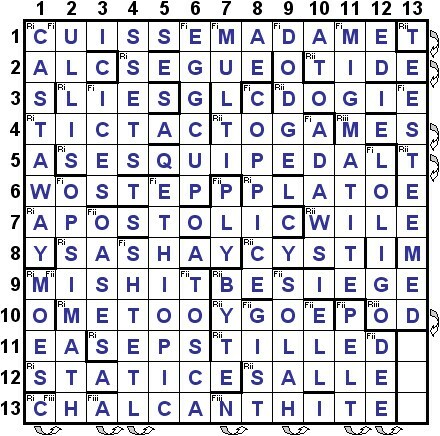 Of course, there I found CUISSE-MADAME … it was an anagram of ‘sauces im’ followed by an anagram of ‘made’. This enabled another brief flurry of solving, but after about 1¼ hours I only had about 20 entries placed (including ICES misplaced). 5rk.1 SESQUIPEDAL Une moitié de gosses who locally ride in the Tour de France using vélocipède for bike? 12fl.1 LOLIGO Behold, progressing from head, “limbs”, five organs redoubled? LO (behold) + progressive letters from Limbs fIve orGans redOubled; this one had my head spinning! And so to the endgame. My initial guess was that we were faced with a game of Battleships. Rank 4 contained GAMES and 9 and 10 both had HIT. The reason that I didn’t suss the whole of Rank 4 was that I’ve always thought it was tic-tac-toe with an E. In fact, I’m sure it is, but a quick check with our primary reference has tick-tack-toe, tick-tack-too and tic-tac-to. So that was the theme and, I assumed, the “mostly incorrect description of the remainder of the final grid”. But where was the instruction? The symmetrical row to TIC-TAC-TO GAMES read O, ME TOO, Y[our] GO, DOPE … well, ‘dope’ was reversed, but hey! No, I decided that was far too convoluted. But, and here I am being brutally honest, my scrawly writing and the bars that I had stupidly decided to put in my working copy of the grid, enabled me not to spot MULTI and PLY and BYTE and N! Instead, I wondered whether the instruction snaked around the grid a bit. Now all that remained was to fill one of the three empty squares. A quick inspection showed that these formed part of a valid game of tic-tac-toe in the lower right 3×3 block, which, with my X in the bottom right corner, gave me a winning line. Well done me, and well done Ozzie for a superb puzzle. What looked as though it was weird and convoluted turned out to be exactly what was required by the preamble. In all it took me two lots of 1¼ hours for the grid and at least another 1¼ hours to find the message and check and recheck all the noughts and crosses in my solution! I did a blog for a Salamanca puzzle at fifteensquared last month (Enigmatic Variations 1001, Croquet), and here I am doing one for LWO a couple of weeks later. With Salamanca, you can normally expect the quirky (as evidenced by his last Listener The Glady Marsh or should I say Thea Gladys Marsha?). This week we had a puzzle ostensibly about Sherlock Holmes’s gnashers, rather than his Adventures! Salamanca’s EV Croquet puzzle took me about 45 minutes, but I suspected that this one would take longer. Some clues had wordplay only, whilst others were entered with variations similar to that of the title. I guessed that referred to Adventures losing two letters to become Dentures. Since the wordplay was to the entry, I hoped that this would make them quite easy to spot and to solve. As it turned out, I was … well … wrong! Zipping through the clues was fairly fruitful this week. 10ac CLERIHEW was the first, helped by having come across LEW meaning ‘lukewarm’ a couple of times in recent weeks. I solved five more acrosses quickly before embarking on the down clues. Ten of these were also solved quickly, helped by a couple of hiddens (3dn ‘lifE’S TERrors’ and 5dn ‘altitudinAL Pasture’) and some straightforward anagrams (6dn ‘as in rum’ and 20dn ‘trespas[s]’). Unfortunately, there seemed nothing untoward about any of the clues or entries, with no wordplay only clues nor, as far as I could see, variations similar to that of the title. After about an hour, I had over half the clues solved, and the top line of the perimeter was • • R E • A • U Z • L •. It seemed obvious that we had A PUZZLE, and with some simple guesses as I worked my way around the perimeter, I soon spelled out: Here’s a puzzle we can really get our teeth into, Watson. 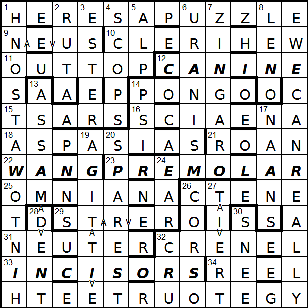 This enabled me to identify CANINE, WANG, PREMOLAR and INCISORS as the thematic wordplay-only clues, none of which I had managed to solve at this point. Nor indeed had I identified any that needed to be entered in a similar way to the title. It took another few minutes to determine that not only did they all lose two letters as suspected, but it was the same two letters, AV, in every case! Wordplay only: REM in POLAR; not a problem for me, but for our older solvers? At least not as obscure perhaps as Amen Corner a few weeks back! As I suspected at the outset, this one took longer than Salamanca’s Croquet mentioned above. However, at just over an hour and a half, it wasn’t a tough puzzle, but entertaining nonetheless. If I hadn’t been so slow to catch on to the thematic entries, I suppose I could have shaved a few minutes off that time.